Bomberman | Shocking Videogame Secrets! Anyone who has ever played Lode Runner for the NES has no doubt noticed that the enemies in the game bare a striking reseblance to Bomerbman. This actually marked the first time Hudson used that design in any capacity. 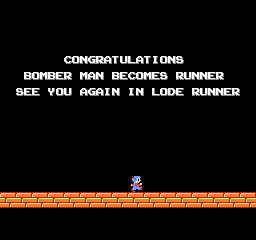 In any case, when you finish Bomberman for NES, he turns into a human and becomes the main character from Lode Runner! 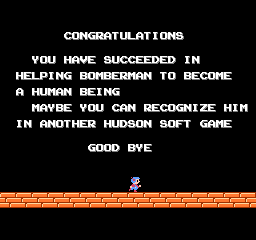 Evidently, Bomberman was a prequel to Lode Runner, and the Runner and Bomberman ARE THE SAME CHARACTER~!!! Cacildo´s note: Original pictures were broken. Had to find new ones around the internet, but i dont know if i got it right.